I am ambivalent towards this book. The premise is very promising, but I find the execution clumsy. The major problem I see is the lack of dramatic tension. For example, the part where Ourika reviews her options as an educated black girl, only to realize none of them would make her happy, feels a little dry. It is a very interesting enumeration of social groups into which the world is divided (or, rather, of groups into which the noblemen perceived the world to be divided) and their rigid boundaries. But it reads more like an academic effort on the part of the writer than like a character moment. The framing also contributes to the lack of tension. The doctor tells us the story of his interactions with Ourika and, inside this story, she narrates her life to him. The problem with this kind of literary device is that you need to make the outer story, the „present day” story, engaging, you need to have something be at stake there. 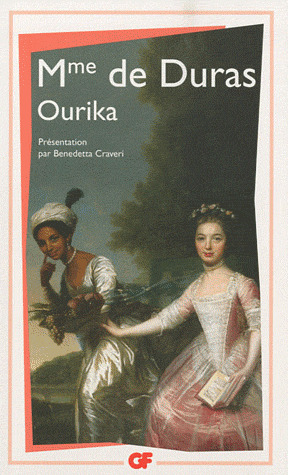 Ourika doesn't quite pull it off: the ending has a twist, but since there's no buildup to it, it is not enough to keep the reader's interest. The end result is underwhelming, since the reader can't get very invested in the inner narrative layer, because she already knows where it's headed, and nothing happens in the outer layer. Ourika is not compelling as a novella, neither the plot nor the characters are interesting enough. But it has a certain historical importance, being based on a true story, and valuable social insights into one of Europe's most fascinating periods. Those elements wouldn't be enough to recommend a tedious novel, but Ourika is short enough to be worth the effort. I will give this book 3 stars, after a lot of thought.